Our digestive tracts are home to trillions of microbes, including bacteria, fungi, and viruses. This microbial community, collectively known as the gut microbiota, plays a role in illness and health. Changes in these microbes have been associated with several diseases including obesity, type 2 diabetes, and irritable bowel syndrome. Dietary emulsifiers, which are chemically similar to detergents, are added to many processed foods to improve texture and extend shelf life. 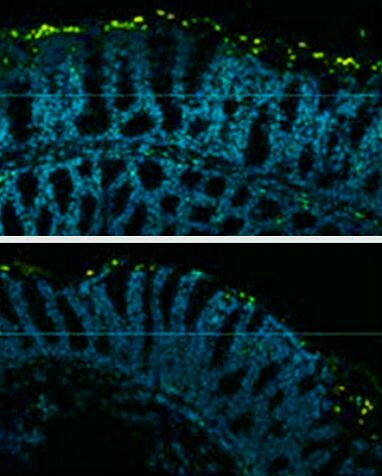 Scientists at Georgia State University previously found that mice fed low levels of common dietary emulsifiers developed altered gut microbiota and a thinned mucus barrier protecting the lining of their intestines. The mice also developed low-grade intestinal inflammation and metabolic syndrome—a group of conditions that increase the risk for type 2 diabetes, heart disease, and stroke. Intestinal inflammation is a known risk factor for colorectal cancer. In their latest study, the scientists investigated whether dietary emulsifiers might affect the risk for colorectal cancer by altering the gut microbiota. The research was funded in part by NIH’s National Institute of Diabetes and Digestive and Kidney Diseases (NIDDK). Results were published online on November 7, 2016, in Cancer Research. The team fed mice standard chow and either plain drinking water or water with 1% of the commonly used dietary emulsifiers carboxymethylcellulose or polysorbate-80. This dose was designed to model the diets of people who eat large amounts of processed foods. Mice fed either of the dietary emulsifiers for 9 weeks developed chronic, low-grade intestinal inflammation and impaired glucose metabolism. The researchers next tested a chemically induced model of colitis-associated cancer. When given a cancer agent, mice fed emulsifiers for 90 days had greater intestinal inflammation and tumor development than mice that didn’t get the emulsifiers. The team found that mice fed the emulsifiers had less gut microbiota diversity and increased levels of inflammatory molecules. The intestinal epithelial cells of mice fed the emulsifiers also had higher levels of both cell death and proliferation. Increased cell turnover is known to play a role in tumor development. When the scientists fed emulsifiers to germ-free mice, which don’t have gut microbiota, these effects didn’t appear. This finding suggests that the effects of the emulsifiers were caused by altering the gut microbiota. When gut microbes from emulsifier-fed mice were transferred into germ-free mice that hadn’t been fed emulsifiers, the germ-free mice developed some of the abnormalities. These results hint that changes in the gut microbiota caused by dietary emulsifiers may play a role in promoting tumor development. “The incidence of colorectal cancer has been markedly increasing since the mid-20th century,” first author Dr. Emilie Viennois notes. “A key feature of this disease is the presence of an altered intestinal microbiota that creates a favorable niche for tumorigenesis.” Whether dietary emulsifiers in the human diet have a similar effect will be a subject for future study. Story from the National Institutes of Health. Original piece written by Carol Torgan. Please note: The content above may have been edited to ensure it is in keeping with Technology Networks’ style and length guidelines.